Bermudian singer-songwriter Heather Nova returned home in triumph last night for her first local show in more than two years when she performed at the Ruth Seaton James Centre. Unlike her last Bermuda show, the open air Millennium Eve concert at Dockyard, Nova performed without her full band and just percussionist Laurie Jenkins and Will Foster on keyboards but if anything, this stripped-down set was more powerful and energetic than in 1999. Read more about this under the section "Articles, Nova shines brighter than ever"
Read more about this article under the section "Articles, Rock Star Burning Bright"
We receive much spam and I decided to publish idiot spam mail on our site, along with my reaction. I also send an email back to the person who send the unwanted email. Go to the section "Spam email" and read my 'spicy' reaction. It is about time to strike back. Dora Casso - Spam or what? Hi there! Sorry for an e-mail out of the blue, but I just did a search for the term buy ny yankee ticket on Google and found heathernova.us ranked 36. Since I publish a related website about Entertainment - Event Tickets (it's strictly informational, so I'm definitely NOT a competitor of yours), I'd like to link to your site. pretty clean and high quality, and I only request to link to other quality sites for exchange). site should get some nice traffic as well. all of the pertinent information. Thanks! Dora Casso RAC IM: 1095026.
found that Dora sent dozens of e-mails around the world with almost the same subject. write an article about you on our site. I am still waiting for a reply but I will inform you when I do receive an email back from miss Casso. PS I forgot to mention that we have nothing to do with ny yankee ticket's. We don't even sell tickets!! and miss Casso "research" was fake! 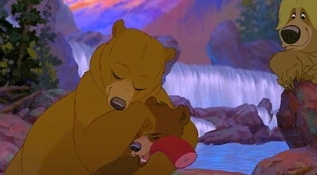 We found a nice trailer on the net from Disney's animation movie "Brother Bear". You can see the trailer under the section "News, Hollywood, Brother Bear"
I disagree with such remarks and that's why I decided to take a look at Moonkara's site "Blue Black". I like the site because it's done by a young lady and I like the heather nova articles on her site as well. Read more about this under the section "Links, Blue Black: Heather Nova"
"I wanted to hear Heather Nova's concert that she gave on the Pinkpop festival but I did not hear anything." I decided to find out for myself and found out that the content, provided by the VPRO (a Dutch Broadcast company), changed their links. We decided to create a script to load the multimedia files from the VPRO and now you can listen to the complete concert. Don't forget to record it on your computer! Go to the section "Multimedia, Audio, pink pop 2002" to hear Heather's concert. We also checked the other third parties’ content from VPRO and restored the Crossing Border video as well and did the same with the audio files. For the crossing border sections, you can go to "Multimedia, Videoclips, Crossing Border now on video" and "Multimedia, Audio, Spoken Word". For Heather's live performance on video you can go to the section "Multimedia, Videoclips, Live at pink pop"
I hope that this will bring a smile on your face. I received an email from Kammy Jones with an attractive photo from her and Sunny Jones, a beautiful yellow cockatiel. Go to the section “Personal, Pets, Kammy & Sunny” to find out what Kammy has to say to us and see the very nice photo of Kammy and Sunny! Thanks for your contribution, Kammy. I really appreciate it! I woke up at 8Am and started my computer. Nothing special about that. Nevertheless, I knew that the ticket sale for Heather's concert in Paradiso will start today at 10Am so I wanted to have my tickets before it is too late. I started the internet at 10Am and went to the 'ticket master' site from the Netherlands to buy seven tickets (including four tickets for friends) for Heather's concert on July 6 (on her birthday). Guess what: the site was not online. Damn, I hate that. Why me? I wonder while I was looking for a phone number to order the tickets via a call center? I started to look on the 'phonebook'service from KPN for the Netherlands. It was close but no cigar. I could not find the number contacted with 'Ticket master or ticket service'. I felt bad, really badly. Thinking: 'Oh my god. I will miss all the fun, pity me. Than I called up a payed service number from the KPN, 1.34 Euro (about 2 US Dollars) to ask for the 0900 service number from 'Ticket master'. They gave me the number all right and I had to call a 0.47 Euro per minute (about 70 dollar cents) to hear that all lines are down. Damn, I really did not know what to do. I knew that I did not have much time to begin with because I had to go to Belgium to visit some friends in Ghent. A 2 ½ hour drive from Amsterdam. The Netherlands is not a very big country. It is about the same size as Florida (perhaps even a little smaller than that). We received a site submission from Rod Costa, a Portuguese Photographer, Filmmaker, Artist & Thinker from Funchal,Madeira-Portugal. You can find this site via the section "Links, Rod Costa"